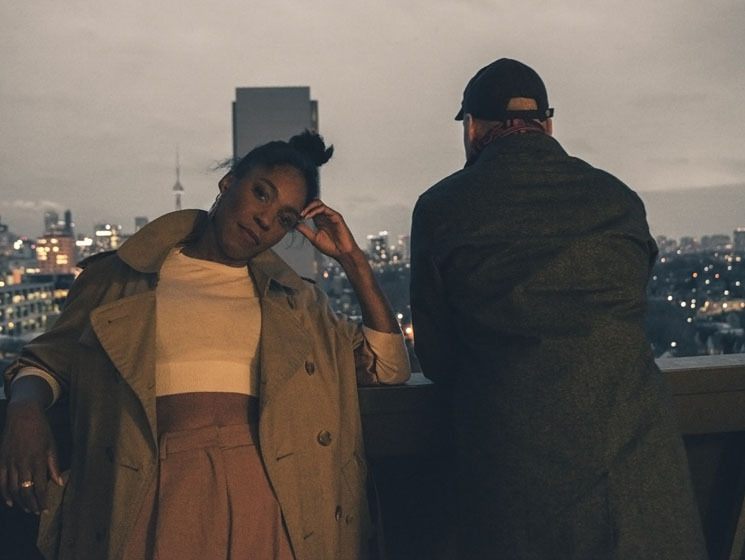 Alanna Stuart and Ian Swain don't just make majestic, dancehall-inflected R&B together as Bonjay— the Toronto duo also converse in a far-flung tongue that few of us can understand. During an interview with Exclaim! over Skype, singer Stuart answers a question about the delay between Broughtupsy, Bonjay's 2010 EP and their forthcoming Lush Life album. She stops mid-sentence and speaks to Swain in an entirely different dialect. I check the connection for interference, because what she's saying sounds just shy of English to me, yet also indecipherable. "I just spoke to Ian in a pig Latin that my mom used with my aunts in Grenada when she didn't want me to understand what she was saying," Stuart explains. "I've been around it enough that I picked up," Swain quickly adds. "I switched to that to ask Ian how honest we should be," Stuart says, before continuing: "One of Bonjay's biggest fuckups is that we finished this record, had it done and mastered, years ago." Before they released it, the pair's perfectionism got in the way. Stuart equates it with her first time applying makeup. "I hadn't played with the colours or blending enough to make it look like something you should wear in public. Listening to the record, I could hear us trying so hard, but not quite getting there." In order to up the ante, Swain built on his already impressive DJing skills by delving into musical theory. Stuart, meanwhile, brushed up behind the studio boards. "Now I feel much more mature when I sing," she says, "and when I'm in the studio, I know how to mix. So when we go to write a song today, the storytelling is way more vivid." Now they have the technical knowhow to create hazy, immersive soundscapes strategically tinged with dancehall elements to jolt the listener. The penetrating tip on that auditory arrow is Stuart's sultry delivery and lyrics, which pierce all the way back — long before the duo's current songwriting prowess, before they began speaking pig Latin together, and before they left their respective sleepy corners of Ottawa (where Bonjay originated) and ventured to Toronto for more frenzied, fringe experiences. For Swain, that meant being accepted into a masters program at a Toronto university. Stuart, meanwhile, was leaving behind her Jamaican father and mother from Grenada who raised her in the strict Pentecostal faith. "There's a lot of pressure when you leave, coming from an immigrant family. My parents didn't come here to endure racism and the winter for me to do nothing. So I didn't feel like I was leaving my family — I felt like I was leaving their expectations." Bonjay drew heavily on those formative memories during the sessions for Lush Life, especially on the opening track, "Ingénue." Stuart says the song was also inspired by an adventure-starved friend who similarly ventured from her small hometown to a major urban hub. She thinks listeners will innately relate: "So many people flock to the city to become their new selves." Stuart has also been inspired by many more ingénues who have passed her by. "Not to sound creepy, but I'm watching people and listening to the nuances of their experiences," she says with a chuckle. She says that habit stems from her childhood, when her mother brought in foster children from Brazil, Jamaica, tiny Inuit villages and everywhere in between. "It meant my sister and I were the minority in our own home. It put me in a position of being an observer," she says. "And I write lyrics from that vantage to this day, because I've always experienced the world as an outsider." Lush Life comes out May 25 on Mysteries of Trade. Bonjay Announce Debut LP, Share New Song "Chelsea"